On the evening of December 2, TASCHEN hosted the U.S. launch of Gustav Klimt: The Complete Paintings at New York City’s Neue Galerie, the esteemed museum of early twentieth-century German and Austrian art and design, located at 1048 Fifth Avenue. The launch was attended by over 100 VIP guests, including Warren Weitman, Chairman at Sotheby’s, Jane Kallir, Director at Galerie St. Etienne, Dr. Theodore Feder, President of Art Resource, and Tom Lamb, Director of Books and Manuscripts at Bonhams. Leading members from the press were also in attendance, including journalists from The New York Times, The New York Review of Books, Vanity Fair, Art in America, ArtInfo, Interview Magazine, and Architectural Digest. After a brief introduction by TASCHEN classics editor Dr. Petra Lamers-Schütze, Klimt editor and author Dr. Tobias G. Natter gave an inspiring speech about Klimt’s life and passions, as well as how fortunate he felt to have been able to work on a book of such grandeur with TASCHEN. A special power point lecture was then given by nobel laureate Dr. Eric Kandel who lent fascinating insight into the links between neurobiology and Klimt’s paintings, emphasizing how TASCHEN’s Klimt monograph was one of the most brilliant books he had ever seen on the artist. Following the talks, the bustling crowd enjoyed drinks in Café Sabarsky as well as The Neue Galerie’s impressive three floor art collection which includes Gustav Klimt’s famous Portrait of Adele Bloch-Bauer I, works by Egon Schiele, Oskar Kokoschka, and Otto Dix. 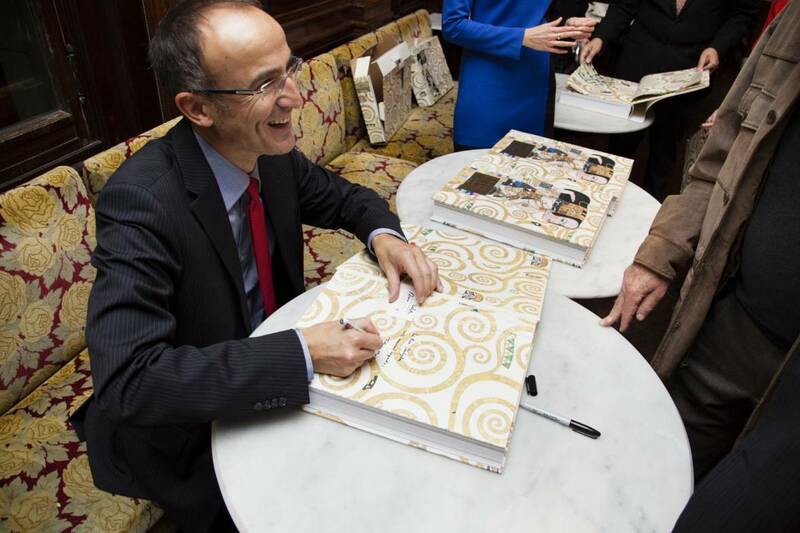 The many members of the press and other Klimt aficionados were happy to take the opportunity to chat with Dr. Natter and get their newly purchased book signed. Nobel laureate Dr. Eric Kandel, author of the book “The Age of Insight” and Dr.Tobias G. Natter, Director of Museum Leopold, Vienna. © Photo: Isabel Asha Penzlien Guests give a hand to the evening’s speakers and the book. © Photo: Isabel Asha Penzlien Dr. Petra Lamers-Schütze gives an introduction to the book.